New skincare range from Look Fabulous Forever: and Link Up | Is This Mutton? What's refreshing about the launch is that Tricia, introducing the products in her blog, is honest and upfront. She is not making any claims about "anti-ageing", a phrase which has come to imply an ability to turn back the clock. But the LFF products can make your skin look better by improving the outer layer of our skin, the epidermis. Our skin has three layers and the structure changes as we get older and oestrogen levels drop. The changes cause the scaffold’ to weaken, causing all the hallmarks of visually older looking skin including wrinkling, sagging and age spots. The surface of our skin, the epidermis, is what people see when they look at our face. And the good news is that this outer layer can be significantly improved by good skincare no matter how old you are. 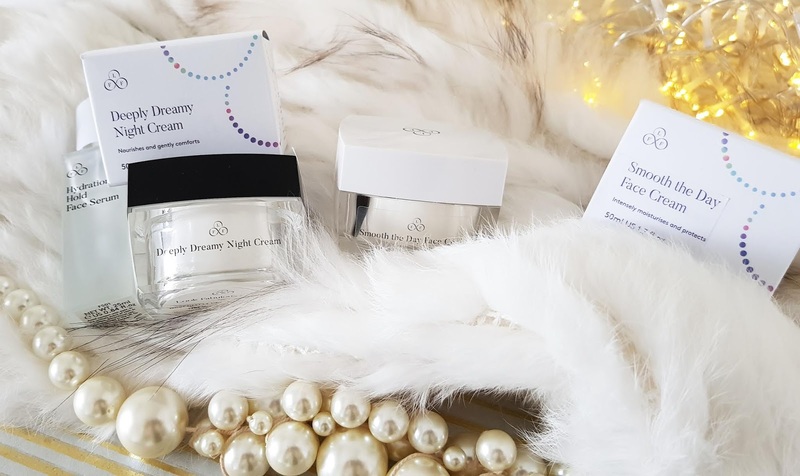 The three first products, Hydration Hold Face Serum, Smooth the Day Face Cream and Deeply Dreamy Night Cream, have been in development for a long time. All three are rich in ingredients which make our skin look better: vitamins, hyaluronic acid, retinol and peptides. The serum is designed to help skin to absorb and retain moisture. It contains 2.5% hyaluronic acid of low molecular weight which penetrates the skin more easily. The serum prepares the skin so that any moisturiser put on top works more effectively. The recommendation is to use the dropper to apply a couple of drops. My skin is very dry so I find I need more than that. The serum dries very quickly and doesn't pill - a major bugbear of mine with a lot of serums on the market. Once I've applied the face cream, my skin does look very hydrated and smooth, and takes a primer and foundation very easily. The face cream is deliciously smooth with a light-as-air texture. Its chock full of useful vitamins: E, C, A (retinyl palmitate - becomes retinol* when applied to the skin and this is a gentler way of formulating it ) and F.
It also contains an anti-pollution active from a daisy extract to protect the skin against environmental factors. The cream has broad spectrum UVA and UVB protection and an SPF of 10. The cream is absorbed easily, is fragrance free and leaves skin feeling moisturised and comforted. I have shied away from using night creams for the last few years. They tend to be heavy and greasy, and don't have me waking up and exclaiming at my wonderfully rested complexion as the adverts would have you believe. But this night cream is very different: it's light and smooth and doesn't leave any greasiness or clog the skin. 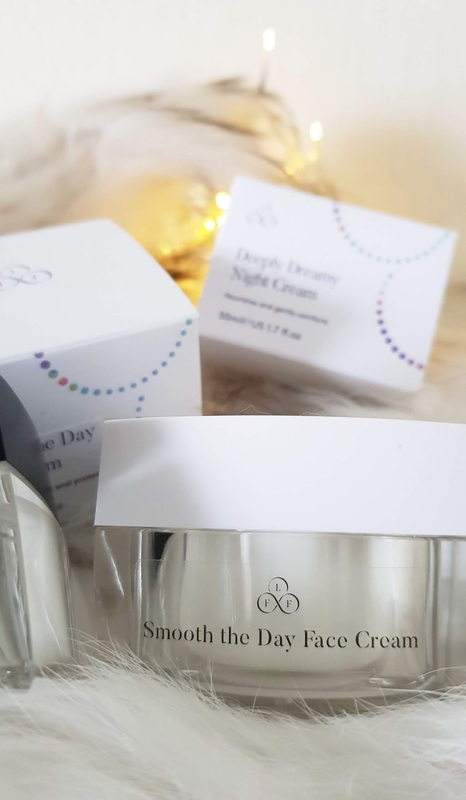 It contains Vitamin E which is deeply moisturising, Vitamin A or retinyl palmitate and Pro Vitamin B5 to enhance skin barrier repair and is both moisturising, healing and soothing. This product also contains hyaluronic acid, again to help the skin absorb moisture better as well as plumping the skin. Finally, it also contains Palmitoyl Tripeptide-5 - a synthetic peptide that is believed to play a role in the appearance of skin tone. The three products have such a double whammy of ingredients beneficial to older skin - the vitamins, the hyaluronic acid, the retinol - that even after a week I can see my skin looking more uniform in texture and sufficiently glowy that I didn't feel I had to wear make-up: a first! All of us are more conscious of the dangers of plastic packaging. The serum comes in a glass bottle, the other two are in acrylic containers. Look Fabulous Forever looked at other options but a lot of bubble wrap and carton inserts would have been necessary to protect the products, which is worse for the environment as it uses more packaging. A recycling programme is in place, currently in the UK. Simply return your empties in an envelope by post and they will get recycled. You can buy Look Fabulous Forever globally, at their website, and there are video tutorials and ambassadors - all the right age too. I was gifted by Look Fantastic Forever: my opinions are honest and unbiased and were not subject to copy approval. Sharing this post with #WeekendBlogHop at Claire Justine, #ShareAllLinkUp at Not Dressed as Lamb and #Continental Drift at Mutton Style. 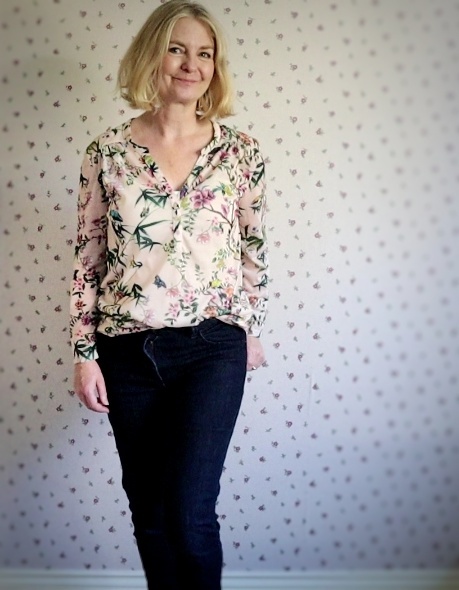 Last week's readers' favourite was Anna from Mutton Style with a post on her new H&M blouses. Interested to hear more about this Gail. Thanks for trialling it. Sporty, thanks for hosting Gail!